I loved the tabs feature in Firefox when they launched, it improves productivity and that is one of the reason i stick to Firefox. What if you could add tabs to any window on your computer, so that you can work conveniently and avoid confusion of opening folders and various programs at once. 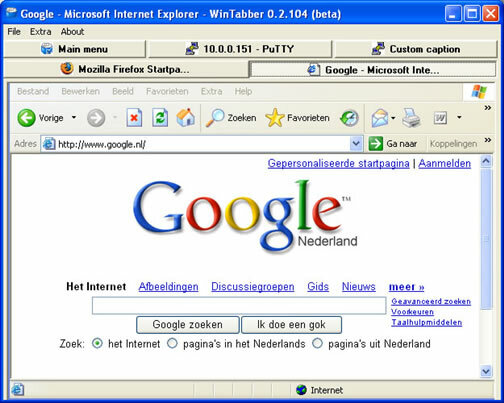 WinTabber is a freeware that allows you to add windows programs to tabs in wintabber. You can add all your opened programs to wintabber as tabs. The only limitation i see in this app is you can not programs directly to wintabber as tabs, you can only add opened programs as tabs. WinTabber allows you to open multiple instances, so you can group similar programs in to one bundle and other programs as another instance. When you add programs as tabs, they won’t show in windows taskbar they will only show in wintabber. If you want to release any program from Wintabber just click an icon and you will see the program in its own window. This is a good app if you need to organize your programs conveniently as tabs. This is very helpful .